they are trying to figure out what kind of attributes you value, how efficient you are in your job, and how well do you tackle a hindrance to achieve that certain goal. This is perhaps one of the best, efficient and common interview question asked. Behavioural foundation is one of the most leading factors that affect a candidate’s eligibility for a given job. It allows the interviewer to explore each and every part of the candidate’s behavioural constituents. 3. 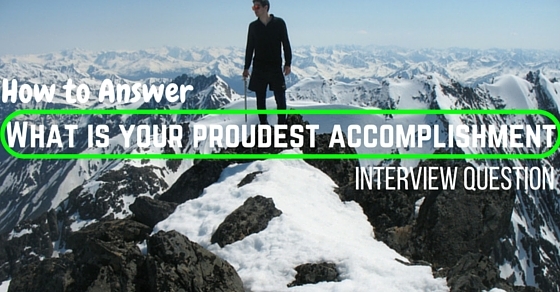 What is your proudest moment in your life? The most foolproof method to answer such questions is to follow the S.T.A.R approach (Situation/ Task/ Approach/ Result). Most candidates tend to answer such questions by following the S.T.A.R approach in a backward manner; this gives the interviewer more chances to ask you questions and to understand what the situation is. Though accomplishments in life gives one great motivation and boosts confidence. But these kinds of questions can put the candidates in a difficult position, when suddenly asked, often leaving candidates feeling ill-prepared. 1. The first step when handling such what is your proudest accomplishment question is to give a good thought about it. Try to consider more than one major achievement, at most three. There are two main reasons for this. Most of the interviewers will ask you a comparison question. For example, to compare your life’s achievements. 2. The second factor to bear in mind is that, when asked about your accomplishments, it can come under both personal and professional achievements. Unless the interviewer specifies what kind of achievement it is, try to answer it in such a way that it covers both the sides. Do not go overboard with personal achievements such as marriage or children or such similar topics. Try to convince your interviewer by stating that my proudest accomplishment are many like learning a new technology by myself and completing the project all alone with in deadline and that you have a great personality and you are able for the applied job. 3. Avoid using clichéd answers and try to define an achievement that is special and specific to you. The more detailed you are, the better it is for the interviewer to get an idea about it. 4. Try to phrase your achievements in such a way that it is evident to the employer that you can be an asset to the company. Do not go into unwanted and unnecessary details. 5. Also, try to consider this as a great opportunity to discuss about various other talents that you haven’t been able to mention in the interview. Try to point out what all achievements you have attained when you were in school, clubs, former companies and so on. 6. If you do not remember any achievements that you have, try to ask your fellow employees or colleagues, previous employers, those who are aware of your work behaviour and employment history. Try to accept constructive criticisms and prove the employer that you are constantly improving yourself. 7. Try to point out some achievements that make you stand out from the rest of the crowd. At the same time, do not overly brag about yourself as this can create a wrong impression to the employer and he/she may classify you as an egoist/narcissist. 8. Do not memorize all your accomplishments; try to be familiar with them. Writing down your achievements before an interview will help you a lot in discussing about it during the interview. 9. Describe an event or situation, which included a better understanding of your work and your area of expertise. This will give an impression to the employer that you are thorough with your work and your surroundings. 10. Explain situations that are relevant to the position you are applying for. 11. Try to explain situations in such way that it connects to your resume and it draws more attention to the resume. If the employer asks you to talk more about them in detail, try to explain it in a flattering manner. 12. Connect the dots, and prove to the employer that you are fit for the job. Try to be as presentable as possible. 13. Try to get a clear picture of your career, the main purpose of such type of questions is for the interviewer to get to know you better and assess your accomplishments. Have you tried to change any old methods in a positive way? Being responsible for a new product. Meeting the required goals or achieving target sales. Established a good bond with fellow colleagues and employers. Resolving differences between two individuals. Establishment of new improvements to the organization by you. Who was the initiator? You or your bosses? How did your higher-ups react to after you achieved the required goal? How well you handled the difficult situations? How well were you able to work under pressure? How did the overall result affect you? Have you been able to improve as an individual? What further improvements you could have done, if given the chance. How has this result affected the organisation you were working for? Try to imagine yourselves in the interviewer’s shoes and think what kind of answers they expect. Tracking your achievements also provides an extra benefit, which makes it easier for you to update your skill level (in your resume or your LinkedIn profile) and hence, none of your abilities won’t go unnoticed. Another main factor while tracking achievements is to make sure that you are picking the most recent achievement. Do not state an achievement that is really old and irrelevant to the employer. For example, moving out of home for college (In reality, you graduated from college 20 years back). Do not try to stress on the negatives of the situation rather than the positives of the situation and your achievements. Try to keep it as professional as possible. Try to address your weakness in front of the interviewer and provide what all methods you have done to resolve these weaknesses. On contrary to just adding accomplishments, the interviewer can also ask you about your failures, if so, try to add minor cases of failure. If you haven’t failed at anything say so; if you have, try to talk about a small failure and turn it into a positive. For example, if you were working on a project and you were behind the deadline, try to explain to the interviewer how did you negotiate with the employer and prevented future problems. Also explain how you divided the workload and how you were able to resolve the crisis. Explain what had caused the failure and what measures were taken so as not to repeat such mistakes in the future. Do not try to blame the whole failure onto a single person. Moreover, don’t try to make up excuses for your flaws. This will show how active you are and how versatile you are under pressure or when the situation gets sidetracked. Do not try to make yourself look in front of the employer good by letting someone else down. Do not try to be over smart and act high and mighty just because of your achievements. Try to be quite humble. Do not try to be irrelevant and present unwanted facts that are not even related to the job. Unless specified by the employer during the interview, do not dive right into your personal life (unless asked for a personal response). Do not fabricate crazy stuff. Try to keep it as real as possible. Even if you just have a small achievement, just explain it to the employer as such. Do not add unwanted details. Try to include situations that might have had quite an impact in your work life and your personality as a working individual. Do not simply just add day-to-day activities as an achievement. Do not consider your achievements as too small or inapt. Every individual has their own fair share of failures and achievements. Instead, try to present them in such a way that the employer will think that you are an asset rather than a liability. By stating your greatest achievements, give an idea to the interviewer that you are versatile and not a one trick pony. Back up your answer with the situation or add small examples. Hesitation in answering such questions can make you look bad in front of the employer. Experiences or achievements you have received during college, in your work. This includes qualifications, certifications, awards, recognition etc. Skills that are transferrable from one job to another. For example, logical skills, analytical skills, reasoning skills, communication skills. Skills that make you unique as an individual. Such as versatility, dependability, honesty, coordination and being a team player. Define what kind of volunteering organisations you have worked for. How your work has benefitted other people and how this has helped you and aided you to grow as an individual. Describing how hard you worked for a sport or a hobby shows how much passion and character you have and how well you have put these into use. Usually this is applicable to novice workers. This shows one’s adaptability to a new surrounding and how well they adjust to changes. Focus on the steps that you took that lead to this achievement. How you handled differences between colleagues and what all steps you took to resolve those disagreements. This will demonstrate how stoic and capable you are in difficult times. Describe the times you have to consider both personal goals along with professional goals. Try to avoid obvious and common answers. For example, “I believed in myself….” etc. Usually when asking such a question, questions related to strengths of an individual is not unlikely. Throughout the interview, try to be as informative and alert as possible. Try to add skills or discuss about your strengths along with anecdotes from your previous work experience. If not given the chance, by the end of the interview you may be asked to add at which point you could give a brief summary about your strengths, and stress how beneficial you are as an employee. The most important factor to take into consideration is to be as honest as possible. Don’t try to blow up your chances of passing your interview just because of your speaking abilities. This may show your incompetent and amateurish side. It can also affect your future job searches and endeavours. So think carefully before you speak. Research carefully about the job and try to state your great accomplishments in such a way that, the whole situation will be tailored to your advantage.